Joe Jonas and his older brother, Kevin, spent Labor Day at the US Open together, and their appearance on the big screen has the internet collectively laughing. 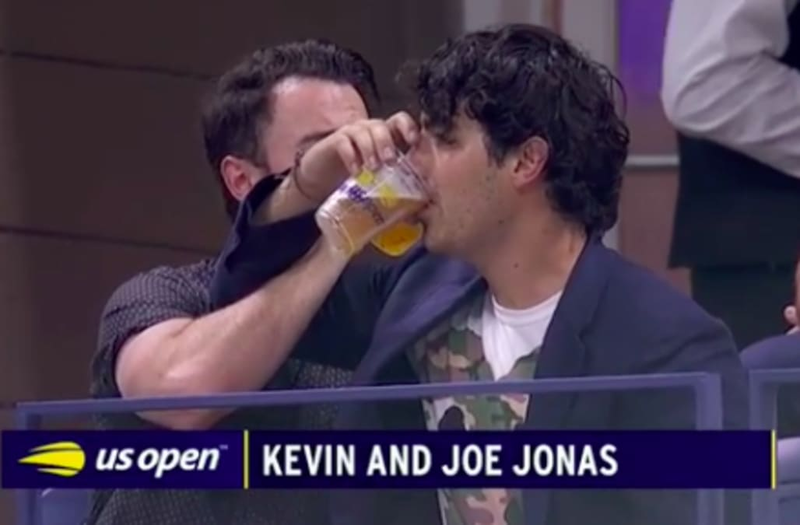 In the video shared by Joe on Instagram, his band DNCE's hit "Cake by the Ocean," plays between games at Arthur Ashe stadium as Kevin and Joe link arms and chug their beers before standing up to floss for the crowd (flossing is the latest viral dance craze dominating the internet). The coordinated pair danced to a roaring crowd as Kevin's wife, Danielle, watched along from the seat over. Joe's fiancée, "Game of Thrones" actress Sophie Turner, was also in the box with them. One person who wasn't there to join in on the fun? Little brother, Nick Jonas, who commented "FOMO" ("fear of missing out") on Joe's Instagram clip. This is the second time in several days that Joe made headlines for a move he made on the audience cam at this year's US Open. On Saturday, he attended the tennis tournament with his fiancée Turner, and the pair lovingly made out when they were shown on screen. Of course, the Jonas' and their ladyloves aren't the only celebrities that have attended the 2018 US Open. Hugh Jackman, Ben Stiller, Anna Wintour and Gayle King have all also taken in the action from Arthur Ashe.